Although there are many contacts apps for Android around, the Google Contacts app only worked for Pixel and Nexus users until recently. Now, all devices running Lollipop or later can run it as well. Android Lollipop and Marshmallow still hold a solid share of the smartphone market each and, unfortunately for their users, sometimes new apps they would enjoy using do not work with them. Google Contacts is such an app that only Pixel and Nexus owners were able to take advantage of so far. Fortunately, the latest update to Google Contacts brings compatibility with "all Android devices running Lollipop and above," as revealed by the official Google Play store page. In addition to this, it also allows its users to merge duplicate contacts from within the contacts list and features automatic suggestions for adding details to existing contacts. Leaving the new features mentioned above aside, this app also allows easy backup and sync of contacts across multiple devices and more. 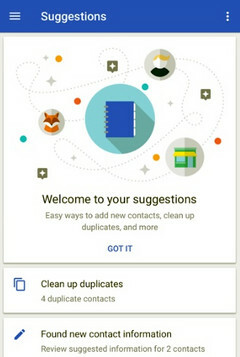 Google Contacts has been installed by more than 10,000,000 times so far and holds a 4.1 out of 5 user rating on Google Play, after receiving over 15,500 ratings.